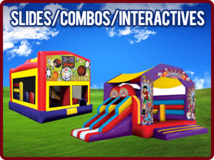 Welcome to Mooney's Fun Jumps and More! TO Start your rental process today you can either choose by date or product. *****For Weekend rentals::::Even if your party is only a Saturday or Sunday, please select the Friday-Sunday dates on the calendar so that your item can't be rented by someone else. Once you get to the Event Info screen there will be a comments box where you MUST put your actual event DAY and TIME. We normally deliver on Friday evening and pick up on Monday Evenings ,Weather permitting, at our discretion, and at a secure location. If your Event is Actually taking place on Friday you need to call us before you book for assistance. 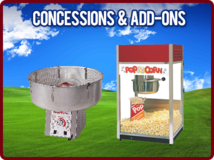 DON'T FORGET TO GET YOUR CONCESSION SUPPLIES FROM US!!!!!! 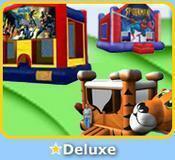 We Only deliver concessions if you are renting inflatables ...otherwise you will need to select PICKUP!